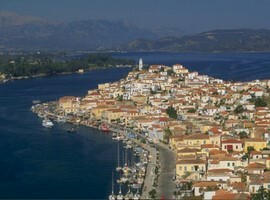 If you are looking to enjoy your vacation on a beautiful Greek island, try out the island of Poros. It is located in the Saronic Gulf and is one of the most favourite place for people who want to spend their time relaxing on the beach. You can even plan to spend your weekend there as it will only take an hour to reach there from the port of Piraeus by ferry. 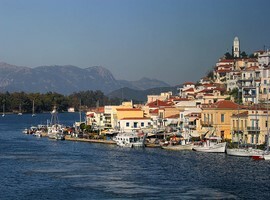 The main harbour and the capital of the Poros Island is the Poros Town. 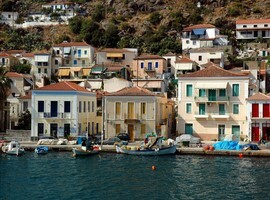 The beautiful town is built on the slopes of the hills of the southern part of the island. It has around 2 km shoreline and it is the hub of the tourist activities on the island. The town has a commercial and economic status. It is also the residential and cultural centre of the island. The terracotta-tiled roofs, the wooden balconies and the long windows of the two-storey white buildings are spread in the town. The roofs of the buildings and the corners of the narrow whitewashed streets covered with hibiscus and orange, fuchsia and red and pink bougainvillea provide a scenic view to the tourists. 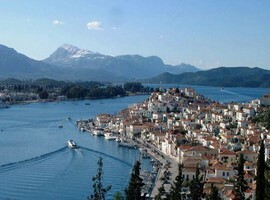 The main tourist resort is located in the north-west of Poros town in the village of Neorio. The village also has its beautiful beachfront. The tourists can easily get accommodated here as the village has some luxury hotels and taverns. You can even take rooms and apartments for rent for your staying. The Poros Island waterfront is filled with sailing item shops, cafes, souvenir shops, florists and restaurants, which make the beach front a lively place with colourful looks. The town has four banks to carry your transaction along with an open air cinema and a post office. The tourist can stay in the hotels, rooms and studios available in the town for rent. You can even find the shops and taverns behind the main street of the town. 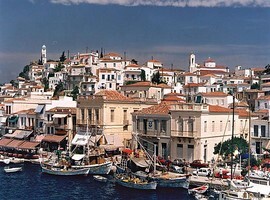 The clock tower is a famous landmark of Poros Island that was built way back in the year 1927. It is constructed at the highest point of the city and the light blue paint of the tower shimmers in the bright sunlight. The tower can be seen from every corner of the town and other nearby places. The imposing clock tower gives a splendid view of the beautiful sunset on the beach and the coast of Peloponnese. It is an ideal place for photographers to capture the unique and beautiful combination of mountain, land, sea and sunset. The beautiful Love Bay surrounded by the long pine tree forest is a serene and a scenic spot for the visitors. Tourists take the sailing ships on rent to have a trip on the sea. The island is a base for many sailing centres and serve the sailing trips as a departure spot for the Saronic Gulf. Poros also holds a historical importance as it is a home to a really old building, the Monastery of Zoodochos Pigi (in Greek means the source of the life). At a distance of four kilometres from the town of Poros, on the eastern side of the main city, the Monastery of Zoodochos Pigi stands with its full grace on the slope of a large pine forest. The monastery was established by Iakovos the Second, Archbishop of Athens. Once he was very ill and passing through a dangerous disease, he drank the nearby spring water, which cured his disease. After that miracle happened on that site, he founded a monastery there. The walls of the monastery are filled with the displays of rich heritage and it is an ideal place to be visited by the students and the lovers of the Greek history. It was a place where the first orphanage of the Independent Greece was set up. It was a home for those orphan children whose fathers were killed in the Greek revolution. Another must see place is the church of Agios Georgios. The church hosts some of the most historical paintings of famous and great Greek painters, such as Constantine Parthenis. It also has a museum with great archaeological importance. The museum is situated on the Korizi Square. Askeli beach is a gem on the surface of Poros Island. It is the most attractive place for tourists. The beach is equipped with every kind of facilities while the crystal clear water, shining in the sunlight attracts the tourists itself. There is also a small chapel sited at the end of the beach an is devoted to the Virgin Mary. The beautiful and peaceful blue and white chapel remains open for tourists during the summer months. At a distance of a few kilometres in the north western side of the Neorio Beach, the large beach of Megalo Neorio is located with its full grace. The clear blue water and the warm shore with the golden sand are an addiction for the visitors. You can easily walk to the Megalo Neorio Beach from the Neorio Beach. The beach is full of water sports facilities to give maximum joy to the visitors. For the staying, taverns and hotels are also available there. 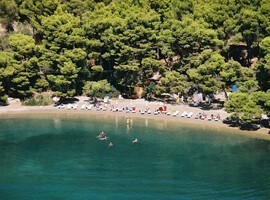 The Russian Bay beach is one of the finest beaches of the Poros Island. 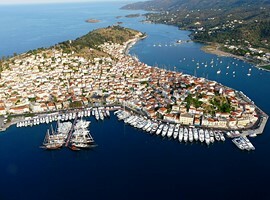 It is located at a distance of five kilometres from Poros town and one and a half kilometres from the Neorio Beach. The beach also holds an historical importance. 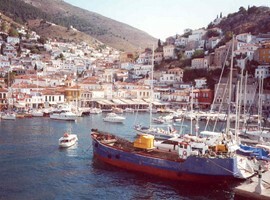 It was served as a harbour for the first Russian ships during the Greek Revolution in opposition to the Turkish yoke. The beach is secluded from the winds and creates a peaceful environment for tourists who want to spend a relaxing time on the beach. The adorable Love Bay beach is an ideal place for the nature lovers. The unique combination of crystalline golden sand, the emerald coloured waters and the white pebbles make this place an earthly heaven for the tourists. It also allows the tourist to do camping under the shadow of the lush green shrubs. 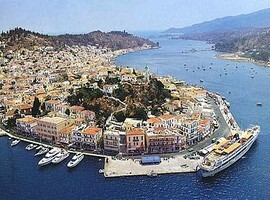 Every hour the bus service takes the tourists to Love Bay Beach and Russian Beach from the Poros Town. There are many hydrofoils that travel frequently, every day from the port of Piraeus to Poros and the trip lasts only 1 hour. These hydrofoils also connect Poros with the other islands, like Spetses and Hydra. There is also a slow ferry that goes from Piraeus to Methana, Aegina and Poros and the trip lasts about 2 hours and half. In addition, there are very frequent ferries (every 15 min) from the port of Galatas, the mainland town which is exactly opposite the town of Poros. There is no airport in Poros but it’s very close to the airport of Athens that receives millions of people throughout the year while the routes are really frequent during the summer. 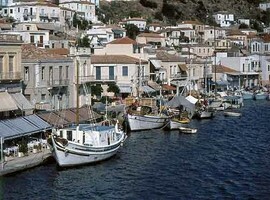 From the city of Athens, there are daily ferries to Poros Island.